The Watts Line I bought on a whim and was really pleasantly surprised at the sophistication of the vocal harmonization; there’s a lot going on there that the singers are trying to pull off. Don’t know much about the group except that, presumably, they were from LA and this 7″ was also picked up by Capitol but I’m presuming it didn’t chart well. 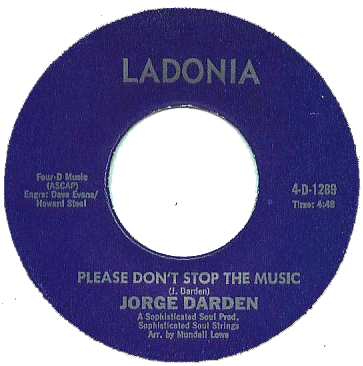 Lastly, we end up with Jorge Darden’s “Alone Again” which I assume it out of Texas (since that’s where Ladonia is). I actually am sharing the b-side of this single on the Nerdtorious site and I’ll repeat the same thing I said over there – what is striking is how Darden has this lounge-act vocal style…reminds me of a less capable J.R. Bailey (but still in the same vein). And it goes without saying that the backing rhythm section is absolutely awesome here. The guitar on “Alone Again” is absolutely gorgeous! Cosine on that ‘Alone Again’ comment. Very unique mix on the vocals, just wish those drums were a tad bit heavier! Thanks for sharing!